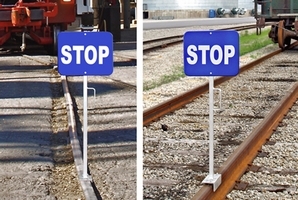 No other sign holder can attach itself to flush rail like our Magnet Base Holder. Aluminum holder utilizes a pair of powerful rare-earth magnets to grip to exposed or flush rail. No more bending or stooping to get a clamp around the rail. The worker just plunks the Magnetic Base Holder down on the rail and goes on his way. Holder stands up to a 60 mph wind force against the sign plate face.